The vivid and colourful country of Vietnam has a whole host of attractions, stunning scenery and compelling history which attracts tens of thousands of visitors every year. With an abundance of dazzling beaches, towering mountains, deltas, islands and the verdant paddy fields inland, not to mention the temples, palaces and tombs, visitors to the country really are spoiled for choice. Vietnam's main international airport is located in the city of Hanoi. You can find a good choice of airlines operating into Vietnam from the UK including Singapore Airlines and Malaysia Airlines. 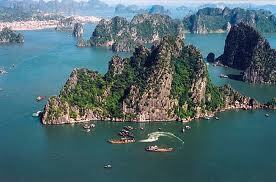 If you prefer direct flights, try Vietnam Airlines from the UK into Hanoi. The European-influenced cities of Hanoi and Ho Chi Minh are packed with ancient pagodas, traditional markets and colonial buildings which blend with the gleaming skyscrapers, funky bars and gourmet restaurants. Take you pick from the superb museums and galleries to visit as well as exotic temples and pagodas to discover. Explore Vietnam’s stunning coastline including NhaTrang, Halong Bay with its mystical limestone islands, Phu Quoc Island with its pristine coral reefs and Mui Ne Beach on the east coast. Trek the mountains at Sapa, home to terrace upon terrace of rice paddies and local hill tribes and explore the old imperial capital of Hue, full of ancient treasures and the host of cultural festivals. Directflights.com is the fastest growing travel comparison site so try our flight comparison facility to find the best deals on cheap flights to Vietnam. Our top tip when you're searching for the cheapest flights is to book early and travel outside of the busiest times of the year. We can help to find superb offers on low cost flights as well as lastminute flights to Vietnam and thousands of destinations across the world. 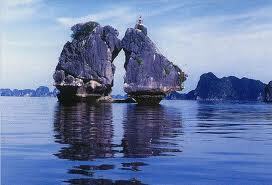 Because of its geography, the climate in Vietnam varies greatly from north to south with three distinct climatic zones. Tropical monsoons occur from October to April in the centre and from May to September in the north and south. It is almost totally dry throughout the rest of the year. It can get exceptionally hot, however, all year round, but the north has a cooler time between October and April. Temperatures around the country can reach up to 40C in the height of the hot and rainy season (May to September), but the northern highlands and Hanoi can often seem chilly and damp in the winter.